After waking up in Chicago where the temperatures hovered around 30°F, I eagerly got on the plane and headed West to Los Angeles. This would be my very first APS March Meeting, and the combination of fear and excitement seemed constant. Fear of being in way over my head while excited to learn more about current projects in the physics field. In order to set aside my nerves, I settled into my “Fundamentals of Modern Quantum Theory” homework for the course of the flight. Four and a half hours later I landed in L.A. with the temperature in the mid-60s and an abundant amount of sunshine. I made my way to the Los Angeles Convention Center that Sunday afternoon to begin my conference journey a bit early with a couple of pre-conference workshops. As a first-time attendee attempting to tackle the March Meeting solo, I valued the connections that I made with my fellow students at the Professional Skills Development Seminar and Undergrad Student Get-Together. This thought was echoed by Brad Conrad (SPS Director), “The presentations are good, but the participants are better.” Conrad also spoke to missed opportunities that he experienced in his early career and urged us to really think about and practice giving an elevator speech so that if an opportunity ever comes our way it will not be wasted. While I didn’t think I would have a big opportunity come my way at this conference, I did relish in the little connections that were made. These small interactions seemed to come randomly and could have been easily missed without realizing it. I met two professors from South Dakota School of Mines and Technology while we shared a power outlet between sessions. We were able to discuss some of the sessions they were attending and what they were presenting. We also spoke about the Ph.D. program at their university, and some of their current research projects. Later that day, I called an uberpool and less than a block later we picked up another attendee (obvious by the badge and pick-up location), the next day we happened to be standing in the same food truck line for lunch. He was an assistant professor at the University of Rochester and we discussed the grad school to tenure professor process and choosing a specialty. Eventually our discussion brought in a few more people from the line to openly debate the educational needs for research positions in academia vs industry and national labs. I also attended a presentation from a student that was presenting her research project from her summer internship, which was the exact internship placement I has just accepted for this coming summer, and she willingly answered my numerous questions about the program. Needless to say, I learned more about what to expect throughout my physics career, found out about possible summer research opportunities in the future, and collected my fair share of business cards. A lot happened by not being afraid to ask questions and make connections as advised by Conrad. While my time was well spent in between the sessions, I also took advantage of the presentations being given. Looking at the schedule it was easy to get overwhelmed and feel in over my head, however the agenda marked sessions that were welcoming to undergraduates and I fully embraced those sessions. 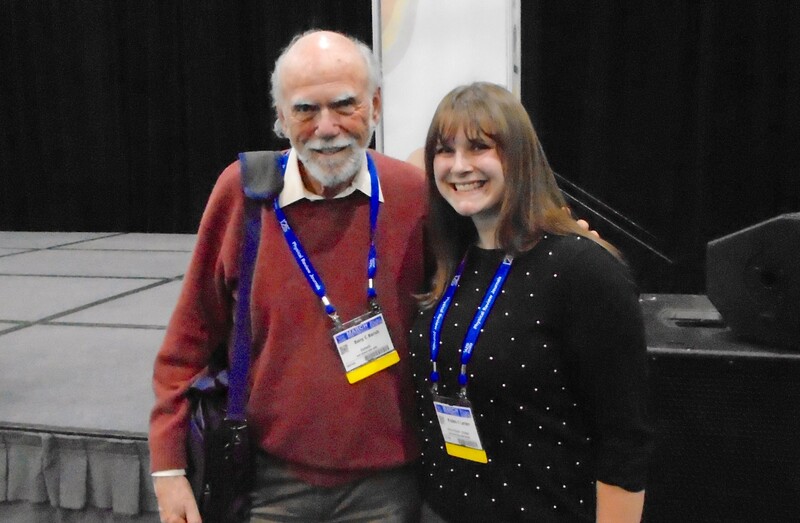 At the conclusion of the symposium I nervously asked Barry Barish if he ever imagined as an undergrad that he would be where he was today. 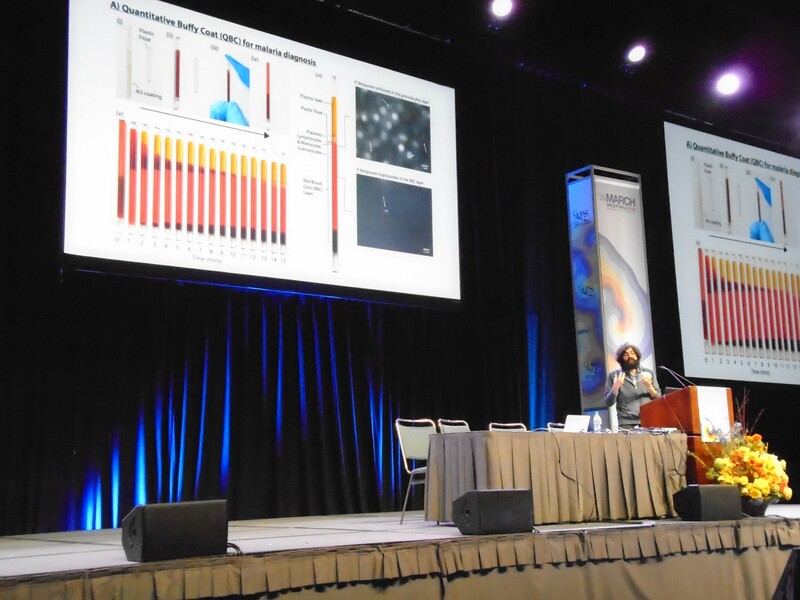 He shared, “Oh no,” and continued to share his undergraduate experience, “my advisor was a very busy man, so I met with many other physicists that were working nearby. As a result, I touched all the physics.” I took that as the advice that I needed as I look forward to my own research: don’t be afraid of tackling something new. As the conference progressed I found myself drawn to projects that were heavily involved with a secondary field of study. Within the undergrad research presentations I was fascinated by the study of the effects of lower gravity on human movement and dance in different atmospheres of the moon and Mars by Justine Walker (Wooster) and the project of Embioptera (silk webspinners) and the effects of silk wetting by Evangelea DiCicco (Santa Clara). Rossella Gabriele presented her project during the poster session. Gabriele is a double major in physics and political science at Washington and Lee University. 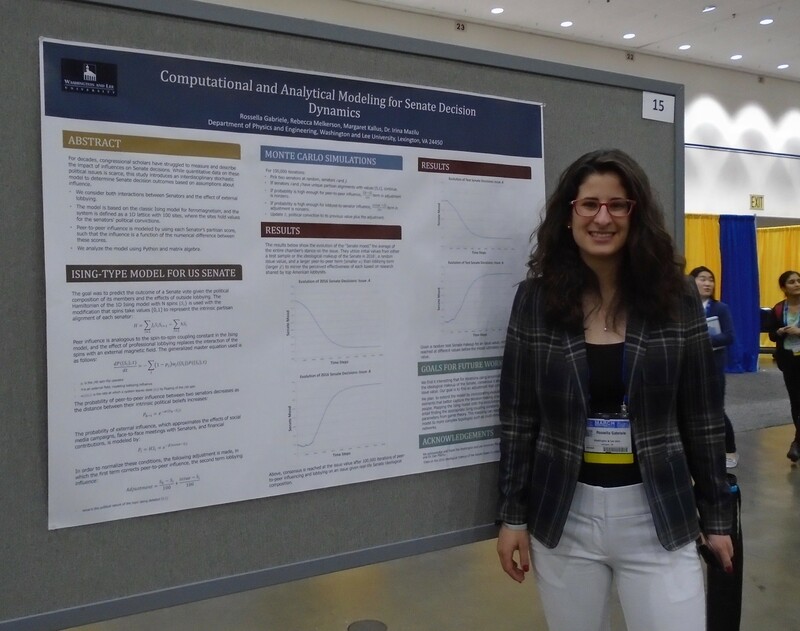 Her project with faculty member Dr. Irina Mazilu, was titled, “Computational and Analytical Modeling for Senate Decision Dynamics.” Gabriele mentioned that Mazilu was eager to do a project using the Ising Model and they were able to work together to form a project that was specific to her educational pursuits. My original intent in attending the APS March Meeting was to learn more about undergraduate research work and the possibilities. Seeing all the research presented gave me a better idea of how to pursue future research opportunities and formulate specific projects with an interdisciplinary influence. Not only did I meet my goal, I found so much value at every turn at the meeting. I felt very much a part of the larger physics community and I can’t wait to begin making my own dent with my internship this summer.